Let priest and people weep. Almighty God, the Father of our Lord Yeshua the Messiah, who desireth not the death of a sinner, but rather that he may turn from his wickedness, and live: He pardoneth and + absolveth all them that truly repent, and unfeignedly believe his holy Gospel. Wherefore let us beseech him to grant us true repentance, and his Holy Spirit, that those things may please him, which we do at this present; and that the rest of our life hereafter may be pure, and holy; so that at the last we may come to his everlasting joy; through Yeshua the Messiah our Lord. Our Father, which art in heaven, Hallowed be thy Name. Thy kingdom come. Thy will be done in earth, As it is in heaven. Give us this day our daily bread. And forgive us our trespasses, As we forgive them that trespass against us. And lead us not into temptation, But deliver us from the evil one. For thine is the kingdom, The power, and the glory, For ever and ever. Amen. All vows, oaths, and pledges which we may be forced to take between this Yom Kippur and the next, of these we repent and these we renounce. Let them all be nullified and voided, and let us be + absolved and released. Let such personal vows, pledges, and oaths be considered neither vows, nor pledges, nor oaths. May all the congregation of the children of Israel be forgiven and all the strangers who live among them, for all the people are in fault. O please forgive the iniquities of this people according to thy great kindness, even as thou hast pardoned this people from Egypt until now. For thou hast told us: “If we confess our sins, He is faithful and just to forgive us our sins and to cleanse us from all unrighteousness”. Confer on us the merit of our Messiah. Good and Forgiving One, pardon and forgive sinners. The Minister says the prayer for the (Shabbat and) Yom Kippur light. Blessed art thou, O Eternal, our God, King of the universe, who hath sanctified us with his commandments and hath commanded us to kindle the (Shabbat and) Yom Kippur light. Blessed art thou, O Eternal, our God, King of the universe, who hath kept us alive, sustained us, and brought us to this season. Doxology: Glory be to thee, O Eternal, the Lord-God of Israel : As it was in the beginning, is now and ever shall be, world without end. Amen. The Lord is King, be the people never so unpatient : he sitteth between the cherubim, be the earth never so unquiet. 13 [For] Solomon had made a brasen scaffold of five cubits long, and five cubits broad, and three cubits high, and had set it in the midst of the court: and upon it he stood, and kneeled down upon his knees before all the congregation of Israel, and spread forth his hands toward heaven. 14 And said, O Lord God of Israel, there is no God like thee in the heaven, nor in the earth; which keepest covenant, and shewest mercy unto thy servants, that walk before thee with all their hearts: 15 Thou which hast kept with thy servant David my father that which thou hast promised him; and spakest with thy mouth, and hast fulfilled it with thine hand, as it is this day. 16 Now therefore, O Lord God of Israel, keep with thy servant David my father that which thou hast promised him, saying, There shall not fail thee a man in my sight to sit upon the throne of Israel; yet so that thy children take heed to their way to walk in my law, as thou hast walked before me. 17 Now then, O Lord God of Israel, let thy word be verified, which thou hast spoken unto thy servant David. 18 But will God in very deed dwell with men on the earth? behold, heaven and the heaven of heavens cannot contain thee; how much less this house which I have built! 19 Have respect therefore to the prayer of thy servant, and to his supplication, O Eternal my God, to hearken unto the cry and the prayer which thy servant prayeth before thee: 20 That thine eyes may be open upon this house day and night, upon the place whereof thou hast said that thou wouldest put thy name there; to hearken unto the prayer which thy servant prayeth toward this place. 21 Hearken therefore unto the supplications of thy servant, and of thy people Israel, which they shall make toward this place: hear thou from thy dwelling place, even from heaven; and when thou hearest, forgive. 22 If a man sin against his neighbour, and an oath be laid upon him to make him swear, and the oath come before thine altar in this house; 23 Then hear thou from heaven, and do, and judge thy servants, by requiting the wicked, by recompensing his way upon his own head; and by justifying the righteous, by giving him according to his righteousness. 24 And if thy people Israel be put to the worse before the enemy, because they have sinned against thee; and shall return and confess thy name, and pray and make supplication before thee in this house; 25 Then hear thou from the heavens, and forgive the sin of thy people Israel, and bring them again unto the land which thou gavest to them and to their fathers. 26 When the heaven is shut up, and there is no rain, because they have sinned against thee; yet if they pray toward this place, and confess thy name, and turn from their sin, when thou dost afflict them; 27 Then hear thou from heaven, and forgive the sin of thy servants, and of thy people Israel, when thou hast taught them the good way, wherein they should walk; and send rain upon thy land, which thou hast given unto thy people for an inheritance. 28 If there be dearth in the land, if there be pestilence, if there be blasting, or mildew, locusts, or caterpillers; if their enemies besiege them in the cities of their land; whatsoever sore or whatsoever sickness there be: 29 Then what prayer or what supplication soever shall be made of any man, or of all thy people Israel, when every one shall know his own sore and his own grief, and shall spread forth his hands in this house: 30 Then hear thou from heaven thy dwelling place, and forgive, and render unto every man according unto all his ways, whose heart thou knowest; (for thou only knowest the hearts of the children of men:) 31 That they may fear thee, to walk in thy ways, so long as they live in the land which thou gavest unto our fathers. 32 Moreover concerning the stranger, which is not of thy people Israel, but is come from a far country for thy great name’s sake, and thy mighty hand, and thy stretched out arm; if they come and pray toward this house; 33 Then hear thou from the heavens, even from thy dwelling place, and do according to all that the stranger calleth to thee for; that all people of the earth may know thy name, and fear thee, as doth thy people Israel, and may know that this house which I have built is called by thy name. 34 If thy people go out to war against their enemies by the way that thou shalt send them, and they pray unto thee toward this city which thou hast chosen, and the house which I have built for thy name; 35 Then hear thou from the heavens their prayer and their supplication, and maintain their cause. 36 If they sin against thee, (for there is no man which sinneth not,) and thou be angry with them, and deliver them over before their enemies, and they carry them away captives unto a land far off or near; 37 Yet if they bethink themselves in the land whither they are carried captive, and turn and pray unto thee in the land of their captivity, saying, We have sinned, we have done amiss, and have dealt wickedly; 38 If they return to thee with all their heart and with all their soul in the land of their captivity, whither they have carried them captives, and pray toward their land, which thou gavest unto their fathers, and toward the city which thou hast chosen, and toward the house which I have built for thy name: 39 Then hear thou from the heavens, even from thy dwelling place, their prayer and their supplications, and maintain their cause, and forgive thy people which have sinned against thee. 40 Now, my God, let, I beseech thee, thine eyes be open, and let thine ears be attent unto the prayer that is made in this place. 41 Now therefore arise, O Lord God, into thy resting place, thou, and the ark of thy strength: let thy priests, O Lord God, be clothed with salvation, and let thy saints rejoice in goodness. 42 O Lord God, turn not away the face of thine anointed: remember the mercies of David thy servant. 4. Grant thee thy heart’s desire : and fulfil all thy mind. 5. We will rejoice in thy salvation, and triumph in the Name of the Lord our God : the Eternal perform all thy petitions. 6. Now know I that the Eternal helpeth his Anointed, and will hear him from his holy heaven : even with the wholesome strength of his right hand. 7. Some put their trust in chariots, and some in horses : but we will remember the Name of the Eternal our God. 8. They are brought down, and fallen : but we are risen, and stand upright. 9. Save, O Eternal, and hear us, O King of heaven : when we call upon thee. 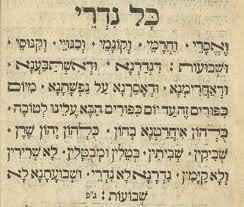 If Yom Kippur coincides with the weekly Sabbath, Psalm 92, the Sabbath Psalm, is sung. If Yom Kippur falls on another day Psalm 92 is omitted. Blessed art thou, O Eternal our God, God of fathers, Creator of the changes of day and night, giving [the/a] Sabbath of rest and bestowing upon us occasions of solemn song in the evening. As thou hast protected us in the day that is past, so be with us in the coming night; keep us from every sin, every evil, and every fear; for thou art our light and salvation, and the strength of our life. To thee be glory for endless ages. Amen. Be present, be present, O Lord Yeshua, our great High Priest, as thou werest present with thy talmidim; thou who livest and reignest with the Father in the unity of the Ruach HaKodesh, world without end. Amen. O God and Father of all, whom the whole heavens adore: Let the whole earth also worship thee, all nations obey thee, all tongues confess and bless thee, and men and women everywhere love thee and serve thee in peace; through Yeshua the Messiah our Lord. Amen. Magnified and sanctified be his great name in the world which he hath created according to his will. May he establish his kingdom during your life and during your days, and during the life of all the house of Israel, even speedily and at a near time, and say ye, Amen. Minister: O God the Father of heaven: have mercy upon us miserable sinners. Minister: O holy, blessed, and glorious Deity: have mercy upon us miserable sinners. People: O holy, blessed, and glorious Deity: have mercy upon us miserable sinners. Remember not, Lord, our offences, nor the offences of our forefathers; neither take thou vengeance of our sins: spare us, good Lord, spare thy people, whom thou hast redeemed with the most precious blood of thine own Son, and be not angry with us for ever. Messiah, have mercy upon us. Then shall the Minister, and the people with him, say the Lord’s Prayer. Our Father, which art in heaven, Hallowed be thy Name, Thy kingdom come, Thy will be done, in earth as it is in heaven. Give us this day our daily bread; And forgive us our trespasses, As we forgive them that trespass against us; And lead us not into temptation, But deliver us from the evil one. Amen. Minister: O Lord, deal not with us after our sins. Answer: Neither reward us after our iniquities. O God, merciful Father, that despisest not the sighing of a contrite heart, nor the desire of such as be sorrowful: Mercifully assist our prayers that we make before thee in all our troubles and adversities, whensoever they oppress us; and graciously hear us, that those evils, which the craft and subtilty of the devil or man worketh against us, be brought to nought, and by the providence of thy goodness they may be dispersed; that we thy servants, being hurt by no persecutions, may evermore give thanks unto thee in thy holy Assembly; through Yeshua the Messiah our Lord. From our enemies defend us, O Messiah. Both now and ever vouchsafe to hear us, O Messiah. Graciously hear us, O Messiah; graciously hear us, O Lord Messiah. Answer: As we do put our trust in thee. We humbly beseech thee, O Father, mercifully to look upon our infirmities; and for the glory of thy Name turn from us all those evils that we most righteously have deserved; and grant that in all our troubles we may put our whole trust and confidence in thy mercy, and evermore serve thee in holiness and pureness of living, to thy honour and glory; through our only Mediator and Advocate, Yeshua the Messiah our Lord. Amen. Take three steps backward. Bow to the left and and say: “He who maketh peace…”; bow to the right and say: “may he in his mercy…”; bow forward and say: “and for all Israel…” After waiting for a short while in standing position take three steps forward. Then follows the Maariv service for Yom Kippur.